These breakout boards feature two DB26 high density connectors; this connector style has 3 rows of pins per connector. The two connectors (one male, one female) are wired 1:1 (pin 1 to pin 1), and all pins are brought out to screw terminals for easy connection. In addition, the shield (connector shell) is brought to a screw terminal as well. 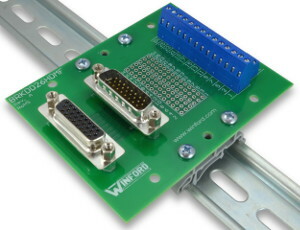 The two connectors allow the board to be easily inserted "in-line" with an existing connection, allowing signals to pass through while being monitored. It is also very convenient for "daisy-chaining" equipment. In addition to the screw terminal connection, each pin is also brought to solder pads (3 per pin) spaced on 0.1" centers, allowing easy addition of standard pin headers. 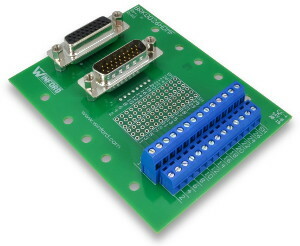 Please note that the breakout boards are manufactured with a connection between each connector pin and the corresponding terminal block position; no soldering of any type is necessary. The solder pads simply provide an area for making optional connections to additional headers or other components. These break out boards are perfect for experimentation and prototype work, permanent installations, or for use in the educational laboratory. They are well-suited for work with I/O cards, CNC equipment, and any other device that uses a DB-26 connector. A breakout board is sometimes referred to as a "transition module", "terminal board", "terminal block", "breakout box", "breakout adapter", "terminator", or "interface module". Approximate dimensions: 3.85" x 3.0"